Have you ever thought “Thailand is too touristy for me”? For all of those who love to travel to Thailand, there is almost equally as many who avoid the country because it is “too touristy”. Tourism is a quirky fellow, full of contradictions, stereotypes, dreams, and …tourists. 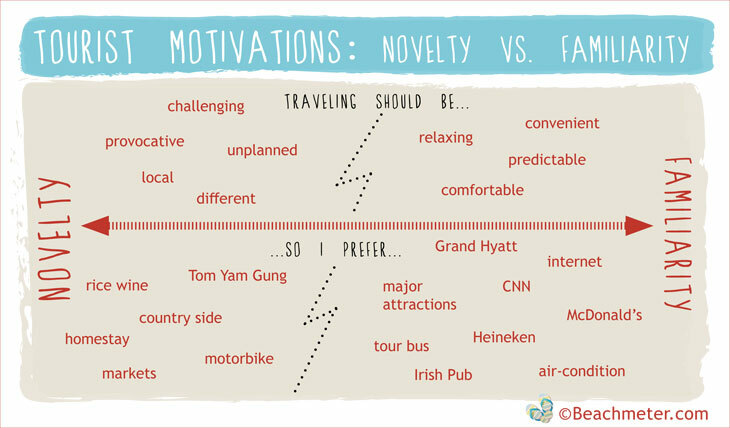 Most people have a preferred balance between novelty and familiarity. The former is exciting, provocative, challenging, and sometimes uncomfortable and stressful. The latter is safe, convenient, and relaxing, but not very mind-expanding. 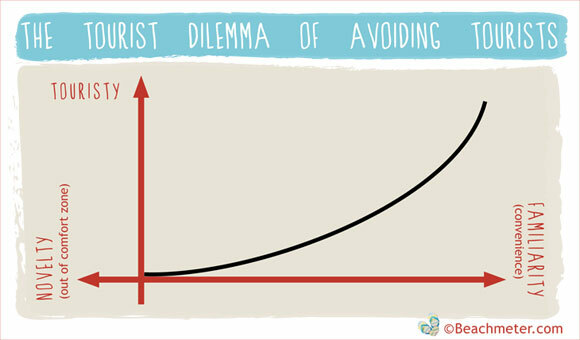 As tourists we juggle along this spectrum when it comes to holiday choices. Most holiday seekers want to relax and reload their batteries in a comfy, fun, and not too challenging environment. This is why all major international tourism destinations offer familiar conveniences and tourism experiences. This is sometimes called a “Tourism Bubble”, i.e. a zone of comfortable familiarity in the midst of a foreign destination with different language, values, traditions, lifestyles etc. The good thing about Thailand is that it’s fairly easy to get away from the most touristy areas, and you don’t have to compromise too much on comfort if you don’t want to. Do you want to find that calm beach with unobstructed views of the sea and only the sounds from the wind and the rolling waves? You might be surprised that even on popular islands like Phuket and Koh Samui this is not that difficult. You might have to take a longtail boat to get to your beach, you might have to sit 20 minutes on the back of a pick-up truck, or you might have to traverse a small hill to get there. But that’s not too much of an effort if your desire is to get away from the crowds. Needless to say, traveling in the low season, will also greatly enhance your chances of avoiding tourist crowds. If you want to reach the more secluded islands in Thailand, they are mostly within a day’s travel combining local transportation and boats. It is likely that you will need to be more flexible regarding your accommodation, meal, and facility options. So if you tell yourself that Thailand is too touristy for you, ask yourself where you would like your holiday to be on the “Novelty vs. Familiarity” spectrum. If you are willing to go slightly off the beaten track on your journey, you can easily avoid the most touristy areas regardless of whether you are looking for cultural, natural or historical experiences. If you want to learn more about the issue, take a look at this great article from Khiri Travel called “This Place is too Touristy“. It sheds light on the dilemma of tourists wanting to avoid touristy areas, while still wanting to see the major sights and attractions. Previous postHotel WiFi: Want to stay online on your beach holiday? Next postGuide: Which Thai Mobile Phone Company should you use?